But there had already been a hiatus in Smyth's career, having heard Mrs Pankhurst speaking she spent two years supporting the suffragist cause, returning to composing in December 1913 during a trip to Egypt (memorably described in her memoir Beecham and Pharaoh). One of the results of this was The Boatswain's Mate. Lacking a premiere in Frankfurt, owing to the war, the opera was premiered in London in 1916 conducted by Sir Thomas Beecham and had moderate success. The libretto is the composer's own, after a story by W.W.Jacobs and tells the story of a pub landlady, Mrs Waters (Nadine Benjamin) who is a widow and is resolutely independent. One of her customers, Harry Benn (Edward Lee) repeatedly proposes but she swears she will not marry again. Benn enlists the help of a traveller, Ned Travers (Jeremy Huw Williams) in a plot to convince Mrs Waters that she needs a man in her life. The plot fails and we are left at the end with the strong suggestion that Mrs Waters falls for Travers. The Boatswain's Mate is not strictly a feminist opera, but it is written from a feminine point of view and like Thirza in The Wreckers, Mrs Waters is a strong, three dimensional female character. In fact she is the most rounded character in the opera, and Smyth breaks opera comique conventions when, in Act One, we get the big solo for Mrs Waters, 'What if I were young again' where we get to understand more of her inner feelings. The composer whose work the piece really puts me in mind is Smetana, and like Smyth, Smetana's work involved both folk-influenced opera with spoken dialogue and large scale German-influenced romantic opera. 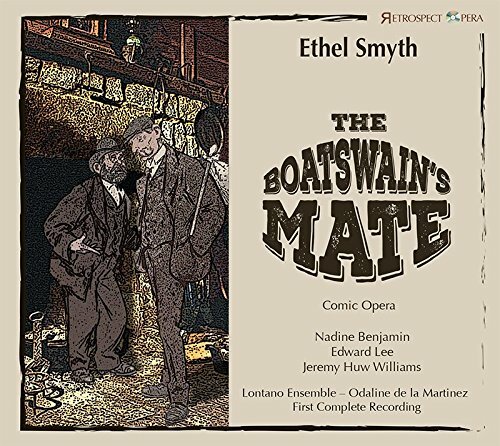 There is a convention is some more serious opera comique that later acts have more music and less dialogue, here Smyth follows this to an ultimate conclusion and writes a first act with dialogue and a through composed second act. Critics at the time were uncertain, and you cannot help wishing she had written the whole through. The recording is not perfect, but it certainly brings out the delight of the piece. The spoken dialogue in Act One is a bit stiff, with the mock country accents jarring and only Jeremy Huw Williams (who uses his native Welsh accent) sounds convincing. But some of the fault is Smyth's as the joins between dialogue and music are a bit rough at times. Nadine Benjamin makes a lovely Mrs Waters, with Edward Lee and Jeremy Huw Williams providing a fine double act as the two conspirators. All clearly enjoy their job, and we have plenty of lovely moments such as the carefree waltz which happens when Mrs Waters tells Benn than he will have to dig the grave for the 'dead' Travers. Their final scene, rather than being conclusive is the promise of a beginning, reminding us that Smyth understood her two principal characters to be mature people (Travers is spoken of as being too old for the army), something nicely captured by Benjamin and Williams. The role of the Policeman (Simon Wilding) is quite small, but important as he contributes to lovely quartet with which Smyth crowns the plotting and which is striking for the way the orchestra fades away at one point to leave the four singers a cappella. The role of Mary Ann (Mrs Waters' maid of all work) is a small one, here admirably taken by Rebecca Louise Dale. After the opera proper we hear a substantial group of excerpts conducted by the composer, important documents indeed. Certainly Ethel Smyth understood the attraction's of Gilbert and Sullivan's style of operetta, she once told Sullivan that The Mikado was his masterpiece. 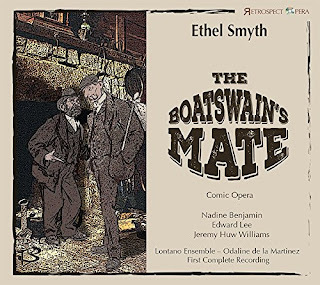 But The Boatswain's Mate whilst remaining light, has more serious concerns which we can understand in the context of Smyth's central European musical background. This recording successfully brings out the work's charms, with all concerned treating the work on its own terms. Odaline de la Martinez and the ensemble surround the singers with some lovely instrumental and solo moments. Recorded St Mary's Church, Walthamstow, 15-17 September 2015, St Gabriel's Church, Walthamstow 19 April 2016.